This article introduces the best vegan and vegetarian-friendly restaurants and cafes in the areas of Ueno, Asakusa, and Oshiage (Skytree) in Tokyo. 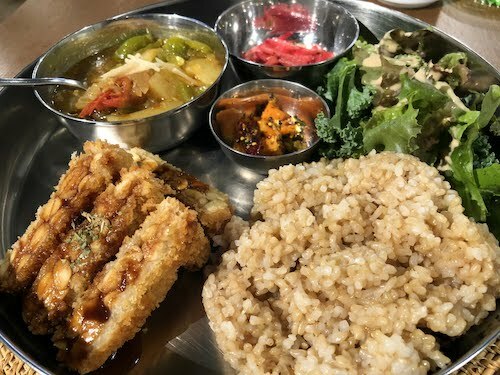 Compared to the western, trendy side of Tokyo with Shibuya and Harajuku, which have relatively more plant-based options, meals may be little harder to find. However, with some planning you will discover a lot of delicious and plant-based food here. This article highlights 5 vegan and vegetarian-friendly Tokyo restaurants close to sightseeing spots with some of the most delicious food in the entire city. If you are unsure about where to visit for meals, read on! 6 Eat Vegan Around Asakusa, Ueno, and Skytree! 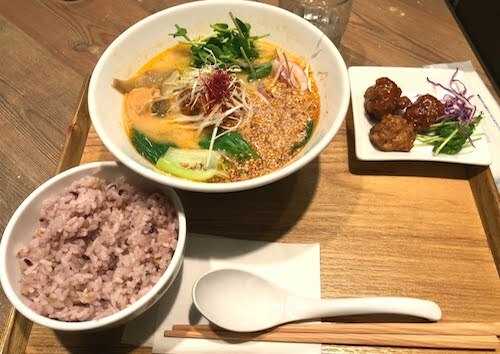 Ts Tantan, located inside JR Ueno Station, is a popular restaurant serving delicious tantan noodles and Japanese ramen that is all plant-based, vegan, and vegetarian. The menu here has different types of tasty ramen, tantan men (noodles), a soy cutlet sandwich, and a ginger stir-fried soy meat dish. 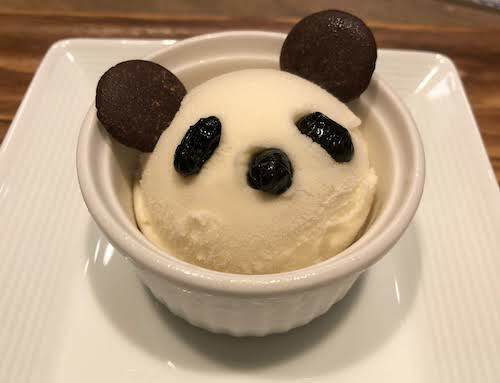 If you are someone with a sweet tooth, there is a panda-shaped soy-based ice cream, as a tribute to the adorable pandas in Ueno. A complete English menu with pictures is usually provided at each seat or will be given to you upon request. The majority of employees here can speak some English, so ordering is not an issue. Shown above is the tonkotsu-style ramen. Tonkotsu is a classic ramen that typically contains a pork-based broth, but this version is completely vegan. This is a hit even with my friends who like traditional ramen. The flavor very delicious and overall satisfying. Pictured above is the gold sesame tantan noodles set, which comes with rice and a side dish (fried soy meat). I recommend getting a set only if you are quite hungry, as the portion size is large! The adorable vegan vanilla ice cream. It is light and very tasty, with vegan chocolate decorations. The tastiness and healthiness of these dishes have made this restaurant very popular since its opening in 2017. It is not uncommon to see a line outside the door here, but the service is fairly fast. Inside you will find a friendly and casual environment. T’s is perfect for stopping in after or before a train ride. Due to the smaller restaurant size and limited seating, however, large parties may be split up. The Ueno branch is the third of the T’s series restaurants in Tokyo, with another T’s TanTan location inside Tokyo Station, and T’s Restaurant in Jiyugaoka. The menus at each restaurant differ from each other slightly, with the special ice cream (pictured above), ginger stir fry, and cutlet sandwich being unique to Ueno. To locate T’s TanTan in JR Ueno Station, enter the ticket gates and follow the signs for ecute, a shopping area on the upper level of the station. SEKAI Cafe is a restaurant with two locations in Tokyo, with one in Asakusa, and Oshiage. Both are close by to major sightseeing spots. The Asakusa location is a short walk from Sensoji, the famous Japanese temple, and Oshiage is down the street from Tokyo Sky Tree. As both close early, I recommend visiting either during lunch time. SEKAI CAFE has a very global theme, with a focus on adapting to all sorts of dietary restrictions and preferences, including vegan, vegetarian, and Halal. You will notice this theme inside each location with the decorating, which friendly and inviting especially to travelers. The Oshiage branch is particularly large and has a second floor with additional seating and power outlets. In addition to vegan and vegetarian options, you will find dishes containing meat and/or seafood here. These restaurants are ideal if you have a party of people with different food preferences. 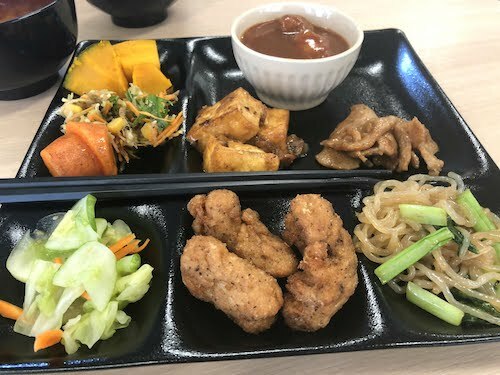 Pictured above is the Fujin Set, a vegan choice from Sekai Cafe in Asakusa. You can choose from a salad or grilled potatoes as your side. 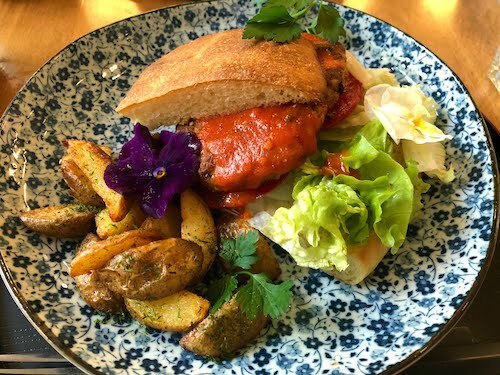 The main dish is a savory burger made from beans and vegetables. The bun is vegan. 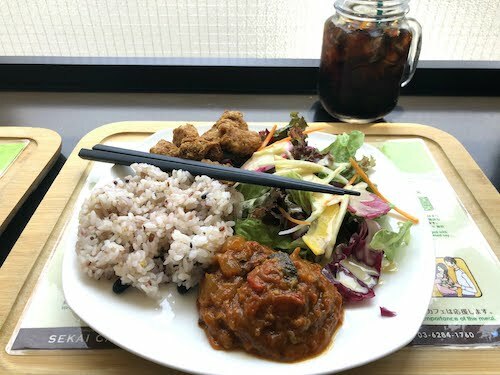 Above is the Veggie Kara Don, a vegan meal consisting of fried soy meat, salad, Ratatouille-style vegetables, and rice. The fried soy meat is seasoned and cooked deliciously and is my personal favorite out of the vegan choices here. At both locations, you will find a menu with English as well as employees who speak English. The menus are clearly labeled with which items contain meat and other allergens, as well as which items are vegan. Kaemon Asakusa is a restaurant nearby Asakusa Station offering an all-vegan, Halal-certified buffet. The buffet is all you can eat for 90 minutes and is ideal if you have some time to spend and are particularly hungry. They also offer non-buffet options as well. The restaurant is somewhat small but provides plenty of seating, including a Japanese-style dining space with tatami mats and low tables. The dishes center around healthy and delicious recipes from Japan and throughout the world and change depending on the day. There is always a large array of very tasty mains, utilizing tofu, soy meat, and vegetables. Fresh salad and pickled vegetables are also available. 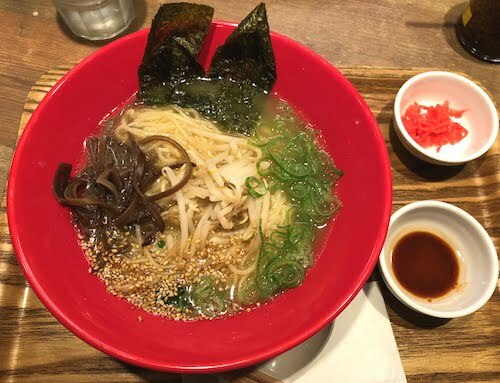 The food is truly delicious and it is definitely worth a visit here, as the restaurant is very close and convenient for those in the Asakusa area. Be sure to try the well-seasoned and tasty fried soy meat (pictured above between the salad and noodles). It is out of this world! 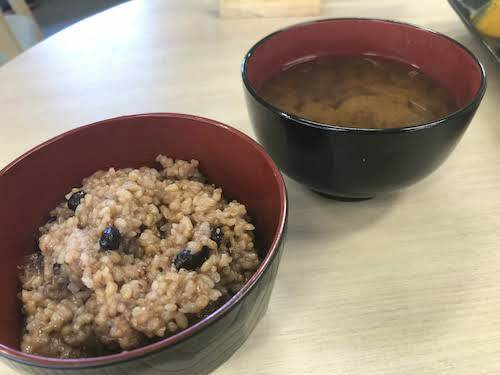 Multiple types of soup and rice (healthy brown rice with enzymes and classic white rice) are also included in the buffet. The environment is very welcoming and friendly here. Many of the employees here speak English, and there is English signage as well. The restaurant operates only during lunch time and has holidays during the week for special events, so I suggest checking the restaurant’s website or calling before you go. 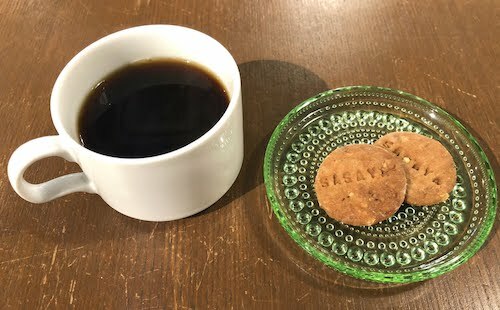 Sasaya Cafe is a vegan-friendly restaurant nestled in Oyokogawa Park, around a ten-minute walk from landmark Tokyo Skytree. Its somewhat hidden location makes it the perfect cafe stop by for a quiet lunch or tea after you have done sightseeing or shopping in Tokyo. There is English support available as well as an English menu. The dishes and drinks here are all vegan, with the exception of a couple items, which are clearly marked. The cafe interior is very stylish, as part of the space is an art gallery (Sumida Park Gallery Sasaya). Sasaya is spacious and offers seats on an enclosed terrace as well as plenty of tables and space inside. The menu contains multiple vegan choices for lunch, including Japanese food, different types of Indian-style curry, and tempeh. For dessert, there are delicious and cakes and baked goods that look almost too good to eat, located at the front counter where you order. I ordered the Indian Curry with Breaded & Fried Tempeh. The tempeh was crispy and delicious, and the curry was seasoned well. Coffee and adorable nut-based vegan cookies came with my lunch set. There is also a little shop corner with an array of interesting vegan items like food products and accessories. The relaxing atmosphere here is welcoming to both larger parties and solo diners, so make sure to make the time to stop by! Sasaya Cafe mainly operates during the day so coming here for lunch is best. 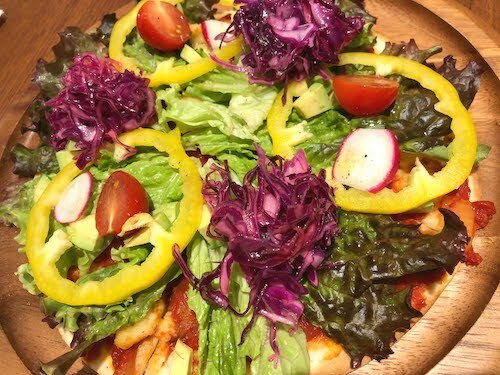 Located right by the Sumida River, this little cafe on the first floor of the ASICS building offers a full vegan menu utilizing bright vegetables and ingredients. As its location is just across from the Asakusa side of the river, you can come here before or after a long day of exploring the area. The interior is bright and clean, and English is on the menu. The food here features a lot of colorful and healthy vegetables. You can find main dishes and entrees like pizza, wraps, and salads, as well as smoothies, drinks, and desserts. One of my recommendations is the vegan pizza. It is loaded with fresh vegetables, including avocado, and contains some soy-based cheese. Pictured above is the taco rice salad, which contains rice, lettuce, plenty of vegetables, and seasoned soy. 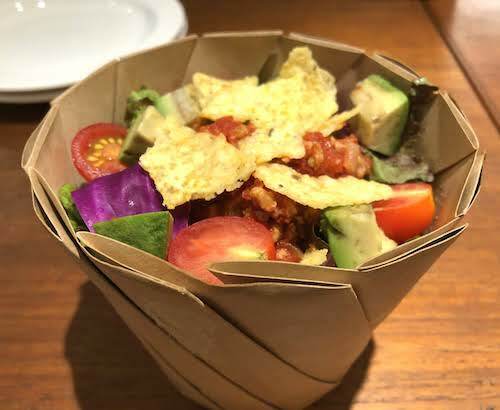 If you order a salad, it will come packaged in a brown paper container, but you can expand the container to make a bowl for mixing the ingredients. There is also dessert here to satisfy your sweet tooth. Pictured above is a ginger cake, which was well spiced and had just the right amount of sweetness. You can also treat yourself to adorable and colorful doughnuts, muffins, and other snacks as well. As this cafe is run by ASICS, the running shoe and activewear company, there is a strong connection to exercise and health here as well. Here you can also take part in yoga on the second floor and outdoor exercise classes around the river. 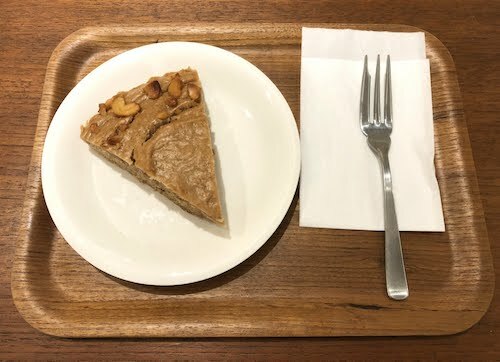 Whether or not you are looking to improve your fitness level, this is a convenient and nice cafe to drop in by when you are around Asakusa or by Sumida River. Eat Vegan Around Asakusa, Ueno, and Skytree! With so many exciting sightseeing spots, cultural and historical activities in this part of Tokyo, it is natural to wonder about meals if you have food or dietary restrictions. Luckily, there are a handful of restaurants and cafes offering reliable and delicious cuisine for those who want to eat vegan or vegetarian. Please feel free to use this as a guide for your next trip to Asakusa, Ueno, and Oshiage (Skytree) areas!